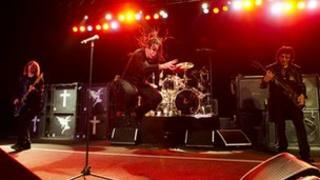 Heavy metal group Black Sabbath have played their first show since 2005. Three members of the original line-up - frontman Ozzy Osbourne, guitarist Tony Iommi, who is battling cancer, and bassist Geezer Butler - performed in their home town of Birmingham. The show at the O2 Academy marked their first concert in the city for 13 years. But original drummer Bill Ward was not present and will not play at their summer festival dates because of a contract dispute with his bandmates. Ward was replaced by Osbourne's regular drummer Tommy Clufetos at the Birmingham show. Iommi is still undergoing treatment for lymphoma and Butler paid tribute on his website after coming off stage. He wrote: "Thank you, thank you, thank you Birmingham. Best fans ever - you brought out the best in us. "It was a privilege playing for you tonight," he continued. "Tony was a hero - you were the best medicine he has had. Proud to be a Brummie." The band performed favourites such as Iron Man, NIB and War Pigs, before closing the show with Paranoid. Rolling Stone magazine called them "a band with all the answers", adding that "warmth flowed from the audience" as tracks were "rapturously received". Black Sabbath will headline Download Festival on 10 June before the Lollapalooza Festival in Chicago on 3 August. They are currently also working on their first new studio record in 33 years. But Ward took to his Facebook page to say he would not be joining his bandmates because he had been asked to sign "a totally unsatisfactory contract". He had been asked to take the stage for just three songs, with another drummer playing on the rest, he said. "I was not prepared to watch another drummer play a Sabbath set, while I was to play only three songs," he wrote. But Butler has posted a statement saying Ward requested an "unrealistic" fee for the Download appearance. "So we resigned ourselves to doing Download without Bill, hoping he'd change his mind and at least make a guest appearance," he wrote.